Can Scott Parker be England’s holding midfielder? Alan Curbishley is the latest unemployed manager to give his thoughts on the England national team, following Glenn Hoddle’s accusation that the team under Capello are “very rigid”. He should be in the England team this week. The midfield of England has been crying out for a holding midfield player. Scott Parker is more than that but if you asked him to hold, and let Frank Lampard and Steve Gerrard go off and do what they do, he would do it. He’s done fantastic for West Ham. He’s got that defensive quality, he can get goals, he can pass. He’s the complete midfield player. This is the ideal time for me – he should be playing this weekend. 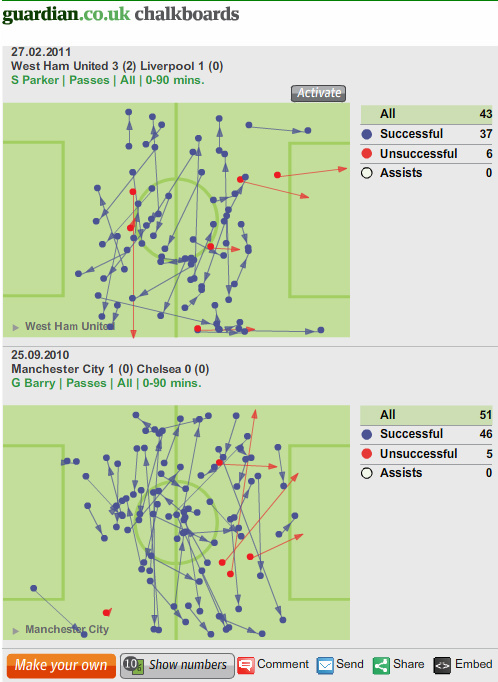 … Gareth Barry also showed his quality in the centre of midfield. He’s not a natural holding player, so we can forgive a couple of rash tackles, but his passing in the past two games has been excellent. I’ve selected matches where Parker and Barry both occupy deep positions (which particularly for Parker isn’t always the case) in order to simulate the England role. According to ESPN Soccernet’s average positions for these two matches, Parker was West Ham’s deepest midfielder, playing slightly behind Luis Boa Morte, whilst Barry sat back but slightly ahead of Nigel de Jong. Parker performed his job as a defensive midfielder admirably, winning 6 out of 8 tackles in good areas. 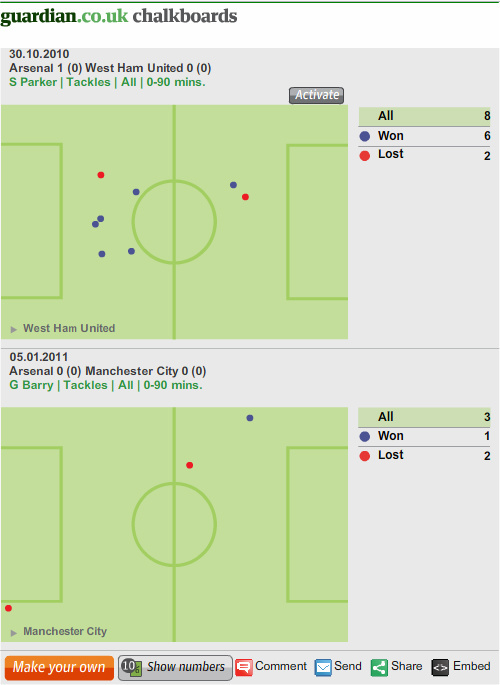 Barry struggles in comparison, particularly when you bear in mind his midfield partner de Jong also had a poor game in this department, completing only 1 of 5 tackles. Barry was unable to support his team mate, with 1 successful tackle from 3. Over the course of the season, Parker has shown himself to be a more than capable in this respect; with 112 tackles he is the fourth most prolific tackler in the league this season, behind Lucas Leiva, David Vaughan and Stuart Holden. His success rate of 77% is only matches by Holden out of the top 5 players. Another element of defensive play, interceptions, is slightly harder to measure given limited access to data, but it appears through chalkboards that both are fairly evenly matched when it comes to reading the game, averaging anywhere between 2 and 5 interceptions per match. Curbishley points out Scott Parker’s goal return – 5 league goals this season – but this isn’t too relevant the defensive midfield role. Whilst he outscores Barry (2 goals), it shouldn’t be part of the main criteria of potentially picking Parker ahead of the Man City midfielder, more a bonus should he be selected. The ability to pass has become a key part of a defensive midfielder’s job, top clubs now look for more than players who simply ‘break up play’ like Makelele did so well for Real Madrid and Chelsea. The modern defensive midfielder must be able win the ball and make a pass; Javier Mascherano being a prime example. So how do Parker and Barry compare in this respect? Again, I’ve chosen matches where the players have performed similar holding roles. Against Liverpool, Parker sat behind Hitzlsperger and Noble, whilst Barry played even deeper than de Jong and Barry at home to Chelsea. There doesn’t appear to be a great difference, though one criticism that can be levelled is that Parker did and can play a number of sideways passes, whilst Barry was and is slightly more adventurous, with a number of passes from the centre circle towards more advanced positions. The statistics back Barry up as a more prolific passer, with 1540 completed passes at a very good 85% success rate, behind Murphy, Essien and Ferguson overall. How do the two candidates compare on the whole? It does seem Barry doesn’t warrant all the criticism he receives, but is this justification to play him ahead of Parker? Perhaps not – at 30 years old Parker has shown himself to be a mature player and a successfully combative central midfielder with an ability to sit deep and give other players the ball with minimum fuss. He clearly trumps Barry in the tackling stakes, and this is perhaps the most crucial element to the role of defensive midfielder. Although, as Curbishley points out, he is not a natural holding midfielder – he has the ability to play in a more advanced role and score goals – he definitely has the attributes to do a job for the national team. Parker showed greater adventure in his passing against Spurs, with a number of balls into the final third despite being under pressure for large parts of the match. He also attempted tackles all over the pitch, a reflection of the work-rate Ben touches on in the comments below. He does indeed have the ability required to play a holding midfield role responsibly. I have to admit I have never been a fan of Barry, and when Parker was heavily linked with Tottenham in the summer and January, as a Spurs fan I thought we should have avoided him, for his injury proneness and his lack of impression since leaving Charlton for Chelsea years ago. It’s also worth noting that as of late West Ham and Man City have been playing similar systems, with three central midfielders. 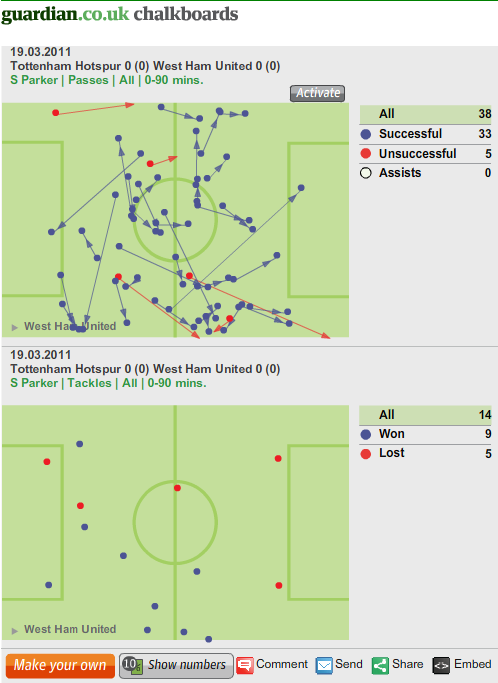 To me, Parker seems to be the more attacking of the two but the stats will tell you there isn’t much difference. It would be interesting to see how much ground the pair cover. I am certain Parker covers more, having seen him all over the pitch on saturday against us. It could be argued that those chalk boards aren’t really good examples, because teams would set up differently away at Chelsea, with respect, as they would at home to Liverpool, particularly as the latter was a stretched game and West Ham led for a long time of it, compared to City trying to play for the 0-0, but let’s not get into Mancini’s negativity again! Gareth Barry is just a glorified left back living off scoring a few penalties for Aston Villa, is what essentially I wanted to say here. Cheers Ben. Fair point on the chalkboards, I was trying to find games against difficult opposition to mimic international competition, but you’re right in saying that one chalkboard isn’t necessarily representative of how they play. That’s where I hope the overall seasons stats somewhat back up their relative strengths.